Marine Breakaway Couplings (MBCs) provide an identifiable safety fuse in offshore fluid transfer systems. The Marine Breakaway Coupling automatically activates and shuts off product flow either when there is undue tensile load on the hose string or an unacceptable surge in flow. The MBC then separates. Gall Thomson MBCs have constantly evolved in response to the vast amount of operational and environmental factors that test the efficiency and safety of transfer operations. The MBC and its internal components are subject to numerous variables including: media type, flow variables, hose types, hose condition and age, maintenance regimes, environmental variables such as sea conditions, weather and temperature, frequency of use, storage conditions, storage time, handling and installation conditions. Gall Thomson has monitored, analysed and reacted to Real-World operational, activation, servicing and refurbishment data by evolving the designs and manufacturing procedures of its Marine Breakaway Couplings. The result is the latest generation of MBCs that have been designed and manufactured in response to this valuable experience and consistent investment. The Gall Thomson MBC is the industry standard. It is compact and lightweight, durable and most important; proven around the world to deliver operational efficiency and to activate only in the circumstances for which they were designed. 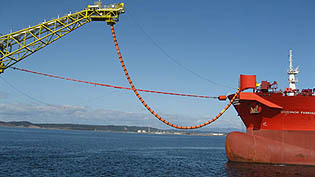 The dangers of tanker breakouts during loading and unloading operations at sea are ever present and can occur quickly. When an event occurs then the MBC activates. The Marine Breakaway Coupling therefore reduces the risk of spillage. This protects the environment and greatly reduces the cost of clean-up and downtime. Risk of damage to transfer systems and assets is also minimised as is the risk of injury to the workforce. In a marine environment where a loading or discharging vessel breaks from its mooring or in the event of an extreme pressure surge, the marine breakaway coupling separates when its pre-set parting load is exceeded. Gall Thomson MBCs are available with either the Petal Valve Type or Flip-Flap Valve Type. The Petal Valve Type MBC is suitable for higher viscosity products such as crude oil. Its full-bore design offers many advantages, including zero headloss and being fully Piggable. The Flip-Flap Valve Type MBC was designed for low viscosity products such as kerosene and LPG. The Flip-Flap Marine Breakaway Coupling offers low headloss and 100% shut-off.